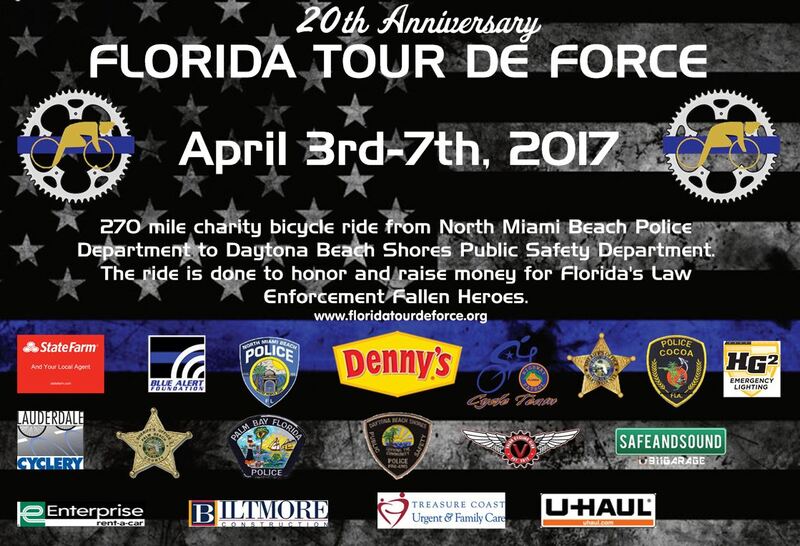 "The 20th Annual Florida Tour de Force police charity bicycle ride is set to kick off April 3rd in North Miami Beach and end in Daytona Beach Shores on April 7th. The Tour is a 5-day ride that averages approximately 50-55 miles each day at a moderate pace (15-17 mph) and will pass through 42 law enforcement jurisdictions. The tour is a fully supported ride with police escorts provided by the Florida Highway Patrol, Sheriff's Departments and local Law Enforcement Agencies throughout the state. This is an awareness ride, not a race! Breaks are scheduled approximately every 12-13 miles and the ride is designed to accommodate both inexperienced riders and seasoned cyclists. Last year over 800 law enforcement personnel from across the state participated with over 70 riders completing the entire 270-mile trek to Daytona Beach Shores. This year's tour will benefit the families of all fallen Florida Law Enforcement Officers that were lost in the line of duty during 2016. The citizens, media and various law enforcements throughout the state have supported the ride over the past fourteen years' with great enthusiasm." The ride is open to both law enforcement and civilians.